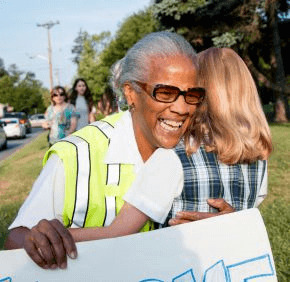 GLYNDON – Eight years ago, Bernadette Jackson looked out her front window and noticed some students from Sacred Heart School having difficulty crossing the street in heavy morning traffic. A Jehovah’s Witness who had no connection to the Catholic school, Jackson called school leaders and asked if she could help. Two days later, she was interviewed, trained by local police and was on the job as a crossing guard. Now eight years on duty, Jackson has become a treasured part of the Sacred Heart community. Dressed in a florescent yellow vest, the white-haired senior who jokingly gives her age as “16” was at the corner of Log House Way and Chatsworth Avenue Aug. 24, holding a handmade welcome back sign. She cheered youngsters as they arrived on foot and in cars on the first day of school. “Good to see you,” she shouted as she waved to a young girl. “All A’s this year,” she said to several others. Many children in cars rolled down windows to wave back at the ever-smiling Jackson. Jackson, who attends Bible studies and volunteers at a local nursing home, knows all students by name. An accomplished seamstress who once ran a laundromat with her late husband, she embroiders the names of graduating eighth graders on special pillows she gives as gifts. She even makes it a point to help children with academics, according to Teri Vining, a second-grade teacher at the school. Jackson is thankful to be part of the Sacred Heart community. After her husband of 18 years, Leroy, died, many students and others from the school checked in on her, brought her meals and supported her. That was also the case after her mother died, and after Jackson underwent surgery. Jackson, who reports for duty at 7:45 a.m. and again at 2:50 p.m., said the most challenging part of her job is dealing with speeding drivers. While those who drop off their children at school obey the speed limit, she said, there are others who do not. No matter the temperature or the precipitation, she’s on the job. Students look forward to seeing Jackson at her designated corner every school day.